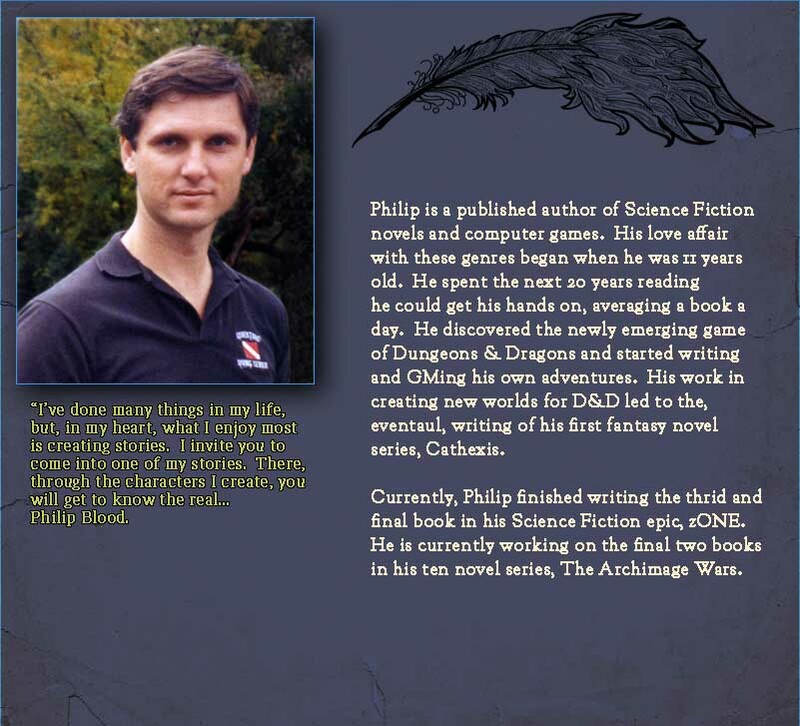 Philip is a published author of fantasy and science fiction novels and computer games. His love affair with Fantasy and Science Fiction began back when he was eleven years old. He spent the next 20 years reading everything he could get his hands on, averaging a book a day. He discovered the newly emerging game of Dungeons and Dragons and started writing stories and running games. His work in creating new worlds for D&D games led to the writing his first fantasy novel series, Cathexis. Currently Philip just finished writing a sequel to zONE: The End and the Beginning, called zONE: Pirate Code. He is now continuing his planned ten novel urban fantasy series, The Archimage Wars. The first seven novels in the series have been published and there are three more to go. He is in the midst of working on the eighth novel in that series. "I've done many, many things in my life, but in my heart what I enjoy most is creating stories, I hope you enjoy my novels. Come on into one of my worlds, that is where you will get to know the real... Philip Blood"